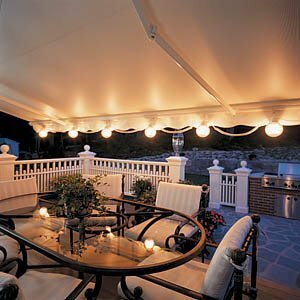 Awnings for decks or patios can be one of the most important additions you can make to your home. They allow you to inexpensively create covered decks, or even enclosed patios with the right accessories. This means you and your family can comfortably enjoy the outdoors even when the weather isn’t cooperating. Whether it’s a hot summers day, or a rainy one, an awning will keep you out of the weather. This means you are more likely to spend time outdoors enjoying the fresh air during much of the year. It also expands the room of your home by creating a comfortable living area in the outdoors. Another way that adding an awning on your deck or patio will help is to spice up the look of your house. Rather than just having a plain, boring wall, an awning brings form and color which allows you to create a whole new look without breaking the bank. The visual flow of the house and yard benefits from the smoother transition that an awning makes from “indoors” to “outside”. If you’re thinking the advantages of adding an awning to your deck end with the comfort of being outdoors it brings, think again. Awnings are actually one of the greener additions you can make to your home. Intercepting the heat energy from the sun, an awning will passively cool your house in the summer. This can lead to a major savings as the amount of heat energy coming in through a window or open door can be quite a lot more than you’d expect. One square meter of sunlight delivers around a kilowatt of energy per hour, which means shading a couple of windows can dramatically reduce the load on your air conditioner. This works best on South facing decks in the Northern hemisphere. And given the inclination of the sun it’s actually more beneficial further North as more light will be entering through the windows or hitting the siding in those cases. As most awnings are either retractable or designed to be taken down in the winter, they won’t interfere with your heating either. Shade when you want it, and warming sunlight when you need it.